Alcoholism is a disease in which people keep craving and drinking excessive amounts of beer, wine, or other alcoholic beverages, even when the drinking harms their health and causes problems at home, school, or work. It raises the risk of cancers of the lip, mouth, neck, esophagus, stomach, pancreas, and breast. People with alcoholism are 10 times as likely to get cancer as the overall population. It can raise blood pressure, disturb heart rhythms, and cause heart failure and stroke. It impairs memory and thinking ability, ranging from one-time "blackouts," in which the person cannot remember a night of hard drinking, to permanent brain damage and dementia (confusion and memory loss). It can cause numbness ortingling hands and feet; painful, swollen muscles; increased risk of broken bones; and infections. In men, it can cause impotence (inability to have an erection). In women, it can cause infertility (inability to have a baby). If continued during pregnancy, it can cause the baby to be born with fetal alcohol syndrome, which may include heart problems and mental retardation. It can cause uncontrollable bleeding from the esophagus and stomach so severe that a person bleeds to death. In the mid 1990s, about 20,000 people a year in the U.S. died as a result of alcoholism. Another 45,000 died of illnesses that are considered alcohol related. Then there are the injuries that drinking makes more likely: falls, fires, drowning, homicides, suicides, and, of course, traffic accidents. Up to half of all adults injured in accidents, crimes, and suicide attempts are thought to have been drinking beforehand. When friends told Roberta she was drinking too much, Roberta kept saying it was not as if she were smoking marijuana or taking cocaine. It was just beer, she told all her friends, something that many people in her school had tried. And besides, she said, her parents drank every night. Roberta's best friend, Mia, sipped a beer with her one Friday before a football game. But Mia decided that drinking beer was not something she wanted to do, even though Roberta kept pressuring her to try it again. Mia became worried when she saw that Roberta did not seem able to control her drinking. Drinking was all that Roberta talked about during the week: How she would get her older friends to buy the beer; how she and her boyfriend would hide it in her purse and sneak it into the game; and how her parents did not even know she had taken one of their beers last night. When Mia tried to make a joke about how much Roberta had drunk last week, and asked if that was why Roberta missed their volleyball game the next day, Roberta got mad. "What are you talking about?" Roberta said. "I only had two beers. And who cares about some dumb game?" Mia knew that Roberta was lying, because she had seen Roberta take four beers and sip from a bottle of peppermint schnapps. Mia knew that before Roberta had gotten into the habit of drinking, volleyball used to be her favorite sport. Mia wondered: What was happening to her friend? Among adults in many social circles, a drink or two of an alcoholic beverage is a common part of many social events in everyday life. People have a glass of wine with dinner or toast the bride and groom with champagne at weddings. Fans at sporting events and people at picnics have a beer. There is even some research that suggests that moderate drinking by adults can lower the risk of heart disease and stroke. "Moderate" drinking is no more than two drinks a day for adult men and no more than one drink a day for adult women and people who are age 65 or older. But millions of Americans drink too much, leading to problems with their health and affecting their families, friends, schoolwork, and jobs: About 14 million people in the United States either abuse alcohol or have the disease alcoholism, according to the U.S. National Institute of Alcohol Abuse and Alcoholism. Other surveys put the number as high as 20 million people. It is a widespread problem, with some experts estimating that more than half of all Americans say they have a close relative with an alcohol problem. Alcoholism is a disease that can affect anyone, from young people like Roberta to the elderly. The numbers are increasing, especially for boys and girls who are younger than the legal drinking age. More boys and men are affected than girls and women. People with alcoholism are addicted to alcohol, so they feel a physical and mental urge to drink. As time passes, the person's urge to drink becomes an uncontrollable craving, like a starving person's hunger for food. This craving for alcohol leads people to behave recklessly, and as a result they wind up failing in school, missing work deadlines, or driving drunk. Yet even when their drinking begins to result in bad grades, family fights at home, legal problems, or job loss, people with alcoholism continue to drink unless they seek help. People who are addicted to alcohol start to need alcohol more often and in greater amounts in order to get the same physical and emotional feelings they used to get when they drank less. Their drinking continues even as their health problems and personal problems increase. If they stop drinking, they may shake, sweat, and feel anxious or sick to their stomach. These are symptoms of withdrawal, their body's adjustment to being denied alcohol. Not everyone who drinks excessively meets the medical definition of alcoholism. When drinking leads to problems but not all the symptoms are physically dependent on alcohol, the disorder is called alcohol abuse. Alcoholism can almost never be overcome unless the person stops drinking completely. People who drink too much, but who do not have alcoholism (are not dependent on alcohol), sometimes can cut their drinking to moderate amounts. But often they, too, need to stop drinking completely. Fortunately, programs can help people stay sober and help families cope. "If My Mother Drinks Too Much, Will l?" Alcoholism runs in families, and many people with alcoholism say they have a close relative with alcoholism, too. But just because a parent or grandparent has it does not mean that the child or grandchild will develop alcoholism. There are many complex circumstances that appear to contribute to whether someone develops alcoholism. Scientists know that alcohol is processed differently in the bodies of people with alcoholism, but no direct link between a gene * or set of genes and how alcohol is processed has been proven. It may be that inheriting certain genes results in personality or emotional characteristics that increase the chances that children would abuse alcohol. The attitudes of family and friends toward drinking alcohol may affect whether people develop alcoholism. Those who abuse alcohol often have family or friends who make it easier or more acceptable to drink excessively. The stress of meeting deadlines for school assignments or coping with personal problems is a normal part of life, but some people use alcohol in an attempt to escape stressful situations. People coping with such conditions as depression and post-traumatic stress disorder also sometimes drink excessively. It is important to remember that it is not a weakness that keeps people drinking when they are under the powerful grip of alcoholism. Rather, alcoholism is a disease, much the same as other physical and mental conditions, and its treatment requires support from professionals, family, and friends. The World Health Organization reports that misuse of alcohol is "a major burden to nearly all countries in the world," resulting in disability, domestic violence, child abuse, and death. WHO says there are about 750,000 alcoholrelated deaths annually and that "alcohol-related diseases and injuries account for between three to four per cent of the annual global burden of disease and injury." Alcoholics Anonymous has almost 2 million members worldwide in almost 100,000 groups. There are more than 30,000 Al-Anon and Alateen groups meeting in 112 countries. Almost 82 percent of Americans 12 and older say they have used alcohol sometime in their lives, according to a 1997 survey. About 40 percent between ages 12 and 17 said they had tried alcohol at some point and 20.5 percent of this age group said they used it in the last month. Total per capita alcohol consumption in the U.S. has dropped since its alltime peak of 2.76 gallons per person (14 and older) in 1980 and 1981. By 1996, it was 2.19 gallons per capita. The top American state for per capita alcohol consumption in 1996 was New Hampshire (4.16 gallons per person 14 and older). The lowest state was Utah (1.29). * genes are chemicals in the body that help determine a person's characteristics, such as hair or eye color or the risk of getting diseases like alcoholism. They are inherited from a person's parents and are contained in the chromosomes found in the cells of the body. AIcoholism first began to be considered a medical problem, rather than a moral one, in the late eighteenth century. In 1788, Thomas Trotter, M.D. (1760-1832) published his Essay Medical, Philosophical, and Chemical on Drunkenness, which defined alcoholism as "a disease produced by a remote cause … that disorders the function of health." The temperance movement continued to espouse abstinence from alcohol. In 1846, the American artist Nathaniel Currier (1813-1888) published his lithograph The Drunkard's Progress: From the First Glass to the Grave. Currier depicted a man whose downfall began with "a glass with a friend" (step 1) but ended with "desperation and crime" (step 8) and "death by suicide" (step 9), leaving a widow and orphaned child behind. 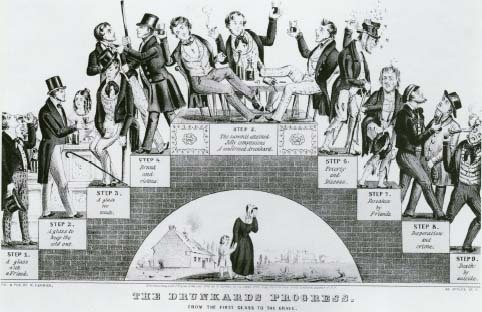 Nathaniel Currier's lithograph The Drunkards Progress: From the First Glass to the Grave was published in 1846. The Library of Congress/Photo Researchers, Inc.
was a person with a disease, because Roberta had started drinking only a few months earlier. Mia could see that Roberta was showing some of the signs of alcoholism, but she did not understand how it could develop so quickly. Alcoholism often develops over many years, but it can develop quickly, especially in teenagers. Alcohol is the most widely used and abused drug among young people. Although the legal drinking age in the United States is 21, more than 50 percent of high school seniors and about 25 percent of eighth graders report having used alcohol. Roberta liked to say that drinking beer was not like using illegal drugs like marijuana and cocaine. But the fact is, the dependency and unfortunate consequences that can result from people drinking alcohol are similar to those that result from taking drugs that are less socially acceptable. Alcoholism is often considered a hidden disease. People who abuse alcohol become skilled at hiding their drinking. Families sometimes help, because they feel embarrassed by their loved one's actions. Also, as the disease progresses, the alcoholic's tolerance for drinking increases. This means they may appear sober even after many drinks or even with an elevated blood alcohol level * . Drinking despite bad consequences to health or problems at home, at school, or at work. Displaying behavior that, if they were sober, would embarrass drinkers or their families. Denying there is a problem even when it becomes obvious to others. Becoming annoyed af those who criticize their drinking. Drinking alone rather than with others, especially to avoid people or situations that had been important in the past. Having mood swings or anger when drinking. Having blackouts in which they forget what happened when they were drunk. Feeling nauseated, anxious, sweaty, and shaky when they stop drinking. Almost 40 percent of U.S. traffic deaths involve alcohol. In 1998, the number of people who died in alcoholrelated crashes was 15,935. High as that was—one death every 33 minutes—it was the lowest level in 17 years. One reason for the decline may have been nationwide efforts to reduce drunk driving. The campaign, focused largely on young people, includes work by such groups as MADD (Mothers Against Drunk Driving) and SADD (Students Against Drunk Driving). Besides seeking tighter enforcement of drunk driving laws, advocates have tried to discourage underage drinking and have promoted alternatives to drunk driving, such as the designated driver. That works this way: if a group of people drink alcohol at a party, bar, or ball game, at least one person (called the designated driver) sticks to soft drinks so that he or she can drive the others safely home. * blood alcohol level is the amount of alcohol in a person's blood, It can be measured with a device that tests for a small amount of alcohol in the breath. In the United States, most states now consider people impaired if their blood alcohol level is 0.07 to 0.10 or higher. * binge drinking is having five or more drinks in a row within a few hours. The amount or frequency of a person's drinking is not a factor in determining whether that person has alcoholism. Some people drink excessively every day, whereas others drink in binges * every month or so. Some people drink amounts that would not be a problem for other people, but that are a problem for them. The important thing is whether the amount people drink causes the physical and emotional symptoms of alcoholism and harms their personal lives. 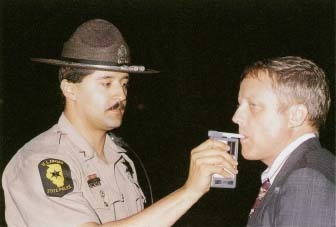 A highway patrol officer uses a Breathalizer field test to screen a driver for evidence of alcohol consumption. © Custom Medical Stock Photo. How Do Doctors Diagnose Alcoholism? There are several ways for doctors to determine if a person has the disease of alcoholism. Doctors or other health professionals can use standard screening tests to see if patients have alcohol problems. These tests can include such questions as "Have you ever awakened the morning after drinking the night before and found that you could not remember part of the evening before?" and "Do you ever try to limit your drinking to certain times of the day or to certain places?" Doctors also can look for physical signs, like liver problems, although these usually indicate that the person has had alcoholism for a long time. The liver is the organ that processes alcohol in the body. Too much alcohol damages the liver over time, causing it to become, fat. In some cases, alcoholics develop cirrhosis (si-RO-sis) of the liver (scarring) or hepatitis (inflammation of the liver). Chronic alcohol use also can damage the pancreas. Alcohol abuse also can cause sleep disorders and malnutrition. It also appears to increase the risk for some forms of cancer and heart disease. People who drink too much are more likely to be injured in car accidents and to become victims of homicides or rapes. Men who drink too much are at risk for impotence * , and women who drink when they are pregnant endanger their unborn babies. How Do People Recover from Alcoholism? Treatment for alcoholism can succeed if the person stops drinking now and forever. Doctors do not say the disease is "cured," because patients always are at risk of developing the disease again if they drink. Patients cannot simply cut down on their drinking. They must stop. 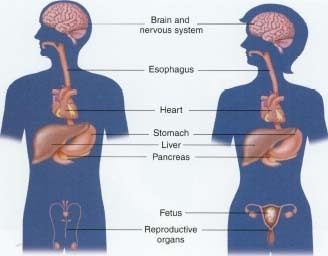 When people drink alcohol, it passes through their stomachs and intestines and is absorbed into the bloodstream, just like any other food or beverage. The alcohol gets into the body's cells, especially those in the part of the brain that control behavior. Like a tranquilizer, the alcohol dulls the central nervous system, resulting at first in a relaxed feeling. The liver eventually converts most of the alcohol into waste products like carbon dioxide and water. But the liver can handle only about one drink per hour. More than that amount begins to make a person drunk, resulting in poor judgment, emotional changes, and problems with walking, movement, and talking. Drinking too much alcohol will kill a person. The effect of alcohol is complex. A full stomach can slow the absorption of alcohol into the bloodstream. Many men and people who weigh more than average usually do not feel the effects of alcohol as quickly as women and people whose weight is average or less. Alcohol also makes the effects of medications more extreme, especially cold medicines that cause drowsiness. If a person is in poor health, sleepy, ortired, alcohol's effects will increase in that person. In the United States, most states now consider people impaired if their blood alcohol level is 0.07 to 0.10 or higher. A 100-pound person can approach or exceed that level after drinking only two drinks in one hour. Someone who weighs 140 to 160 pounds could be legally drunk after three to four drinks in two to three hours. And even at lower levels, judgment and driving skills are likely to be impaired. * impotence (IM-po-tens) is failure of a man to achieve or to maintain an erection. Alcoholism affects many different parts of the body. counselors, employers, and health professionals usually must take the lead by discussing the alcohol abuse and its consequences. Experts say it must become clear to the person with alcoholism that there will be no more "rescue missions" if the drinking continues. The person with alcoholism needs to know that if the drinking causes divorce, job loss, or poor performance in school, no one will be there to help, unless the person seeks treatment. It can be a good idea for family members to seek the aid of someone trained in dealing with alcoholism. If the disease is in its earlier stages, support groups like Alcoholics Anonymous are a first step to recowery. Family members often seek help at Alanon or similar support groups for the emotional troubles they face. Advanced alcoholism often is treated with a week-long stay in a residential treatment center or hospital detoxification * unit. Doctors help patients cope with the withdrawal symptoms, which in advanced cases can include delirium tremens * . Doctors may prescribe medications that help reduce the craving for alcohol or that cause people to feel sick if they try to resume drinking alcohol. The recovery from alcoholism's physical and emotional effects can be a long process. Self-help groups like Alcoholics Anonymous, individual counseling with a therapist, and visits with health professionals often are needed. * detoxification (de-tox-i-fi-KAY-shun) is the process of breaking dependence on an addictive substance. * delirium tremens are also called "the DTs" or Alcohol Withdrawal Delirium. The DTs may occur two to three days after a person with long-term alcoholism stops drinking. Symptoms include rapid heartbeat, sweating, abnormally high blood pressure, an irregular tremor, delusions, hallucinations, and agitated or wild behavior. The delirium and other withdrawal symptoms usually subside in three or four days. With treatment, many people with alcoholism recover to resume the parts of their lives that were disrupted when they drank. But sometimes they go back to drinking for a period and once again have problems with their health and personal life. People who are recovering from alcoholism often say they must take life "one day at a time," because they must maintain constant watchfulness so that they do not resume their drinking. Chiu, Christina. Teen Guide to Staying Sober. Minneapolis: Hazelden Information Education, 1988. This is a good basic overview on alcohol for people who drink and for those who want to learn ways to say no. Rodowsky, Colby. Hannah in Between. New York: Troll Associates, 1996. This is the story of a woman with alcoholism and how it affects her life and her teenage daughter. Langsen, Richard C., and Nicole Rubel. When Someone in the Family Drinks Too Much. New York: Dial Books for Young Readers, 1996. U.S. National Institute of Alcohol Abuse and Alcoholism, 6000 Executive Boulevard, Willco Building, Bethesda, MD 20892-7003. This government agency offers lots of good information at its website, including an easy-to-follow list of "frequently asked questions." Some material is available in Spanish. Alanon-Alateen offers local support groups and meetings that are free, anonymous, and confidential. Their publications include Courage to Be Me: Living with Alcoholism and Alateen: A Day at a Time. Alcoholics Anonymous offers local support groups and meetings that are free, anonymous, and confidential. Their basic program involves "12 Steps" to recovery. Their publications includeA Message to Teenagers: How to Tell When Drinking Is Becoming a Problem.